Leicester scientists have installed their groundbreaking pollution-detecting technology in a plane to map air quality around the city. 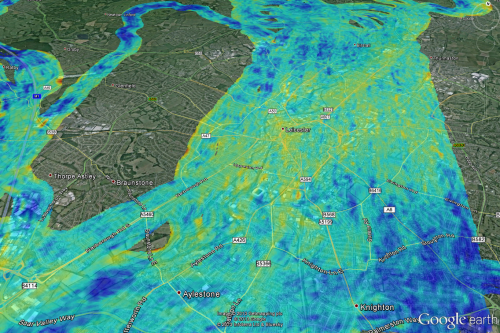 University of Leicester physicists used their sophisticated air quality measuring spectrometer to produce striking "heatmap" style images of pollution levels in Leicester as part of the Airborne Air Quality Mapper (AAQM) project. The images show how levels of nitrogen dioxide (NO2) vary around the city – revealing the differences in air quality between green, wooded areas and busy road junctions and areas of industry. The results could help draw attention to polluted areas – and help inform future environmental planning decisions. NO2 comes primarily from traffic emissions in urban environments and can cause health problems – including increased risk of respiratory illnesses such as heart attacks and bronchitis. The European Commission is pressing the UK Government to find a solution to NO2 in large cities across the country. Large fines may be imposed and new legislation allows these to be passed down to Councils which don't take urgent action to improve their air quality. While not among the worst-affected cities, Leicester City Council is in the forefront of developing local and national solutions to this problem through collaborative projects with the University of Leicester and DEFRA. The aim is to develop smart traffic management schemes and reduce vehicle emissions. As part of the process of developing advanced solutions to this national problem, scientists at the University's Earth Observation Science group, based in the Space Research Centre, have used their world-leading Compact Air Quality Spectrometer (CompAQS) device to map air quality around the city. The device monitors visible light – and measures how much light is lost at specific wavelengths absorbed by NO2. Development of the instrument took place with Surrey Satellite Technology Ltd and was funded by the UK's Centre for Earth Observation Instrumentation and the Natural Environment Research Council. The instrument is part of a major initiative to improve the UK's technological leadership in space instrumentation for Earth Observation. The team have previously used the device as part of the CityScan project – involving several spectrometers placed on tall buildings, which are being used to build a 3D map of pollution across a city. They have deployed CityScan to measure pollution in Leicester, Bologna, and London during the Olympics. The team have now adapted the technology to be used in aircraft – allowing researchers to view the pollution levels beneath them. In February, scientists mounted their spectrometer to the bottom of an aerial survey plane and flew over the city. The device gave a reading for NO2 levels between the ground and the plane – which was flying at around 900m. Each reading corresponds to an area of 6 metres by 100 metres at ground level. They collated all the readings, and overlaid the results over Google Earth – giving a remarkably detailed map of air quality in the city and surrounding areas. Particularly clean areas of the city – indicated by the darker blue spots on the map – include Knighton Park, Oadby Race Course and Western Park Golf Club. More polluted areas – shown in red and yellow - include Leicester Train Station, the St Nicholas Circle roundabout, and the M1 junction 21. The images give a very useful indication of the relative air quality levels across the city – and the team are currently carrying out further research to determine the exact concentrations of NO2 present in the air for each reading. This will reveal the approximate figures for the amount NO2 in the atmosphere – and will indicate whether there are areas where the concentration of NO2 is high enough to be of concern. The researchers hope to carry out further flights with industrial partners Bluesky International Ltd, a UK-based specialist in aerial imaging and remote sensing data collection and processing. In time, they hope to be able to adapt the technology to use on spacecraft in order to monitor pollution levels across the whole planet. Project leader Dr Roland Leigh, of the Earth Observation Science group, said: "This is the first time in the UK anyone has been able to use airborne devices to map pollution levels across whole cities. This information really helps us understand the sources of pollution within cities, and the human exposure downwind. "We are hoping to do carry out further flights as part of the Airborne Air Quality Mapper project – and are looking for potential collaborators and customers." Dr James Lawrence, Research Associate in the Earth Observation Science Group, developed aspects of the AAQM instrument and flew with it during its test flight. He said: "We have a world-first spectrometer which shows where the major emissions of nitrogen dioxide are occurring – typically in industrial or heavy traffic areas. "It is important to note that the measurements do not necessarily relate to the pollution levels at ground level only – each reading takes into account the amount of NO2 at all altitudes between the ground and the plane." James Eddy, technical director at Bluesky, said: "We are thrilled to be involved with such a ground-breaking project, which is pushing the boundaries of 'real science'. The air pollution sensor will really help to help make our cities better places to live in the future." The team are hoping to publish the full findings and analysis later this year.